I wish it would be historically possible—that is, historically honest—for Israel to be omitted from the long list of target countries that have been the victims of terrorism. Alas, it is not. But President Obama has a habit of making such lists, and he always fails to include Israel (or anyplace within its borders) as a target of this distinctive and most vicious form of warfare. Still, the fact is that, as early as the 1970s, Palestinian liberationists had begun to perfect the careful tactics of random battle against Israelis. If not precisely Israelis, then some other Jews. Why not? It’s at least a back-handed admission of the fact of Jewish peoplehood. If not blowing up a bus in the Negev, then a shoot-out at the El Al counter at Leonardo da Vinci Airport in Rome. 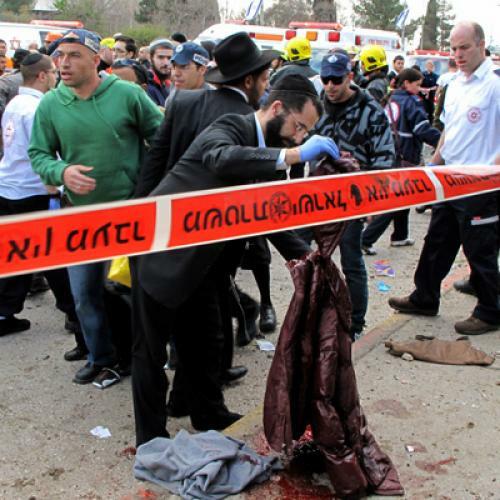 A family massacre in the Galilee, a mass murder of Olympic athletes in Munich, two high-toll bombings in Buenos Aires. In a Jerusalem Yeshiva, on a Tel Aviv thoroughfare. And the liquidation of five members of a family, yes, a family that lived in a settlement. But its three-month-old didn’t really know that. Knife across the neck anyway. As we commemorate the citizens of over 90 countries who perished in the 9/11 attacks, we honor all victims of terrorism, in every nation around the world. … We honor and celebrate the resilience of individuals, families, and communities on every continent, whether in New York or Nairobi, Bali or Belfast, Mumbai or Manila, or Lahore or London. We can join in a new and global partnership to dismantle the networks that have struck in Madrid and Amman; in London and Bali; in Washington and New York. All of these locations suffered the attacks of barbarians, and with these attacks thousands upon thousands of victims. And many more thousands with the victimhood of being robbed of those they loved and of those for whom they cared. Nobody has yet estimated the count of people affected by this epidemic. I do not wonder why. It is not that such an estimate, close to accurate, cannot be undertaken and honestly completed. If truth be told, President Obama has a direct interest in keeping these statistics fudged. For, aside from Belfast, every location he mentions is a place where Muslim extremists have shed blood—and shed the blood of innocents, shed the blood of those who do not even know how to ask why they have been targeted, if indeed they have been specifically or personally targeted which most of them have not been. In fact, none of them have been. They are innocents in a crowd. But not according to their killers. They are guilty by being. This is not the president’s narrative. Apparently and actually, he has no narrative. But he owes us a narrative, his narrative. After all, our soldiers are being killed and they are also killing. And innocents are being killed daily by adversary forces Obama will not name or characterize or define. Who does he really think we are fighting? The Bahai, maybe? Opus Dei? The Lubavitchers? If Obama does not think that we are besieged by several strands of Islam, what explanation has he for the wave of terrorism that has taken place in recent decades? P.S. I’ve made an observation about Obama’s omission of Israel in another list of his once before. In my ex-blog, The Spine, I observed last January that in the president’s litany of countries that aided Haiti in its terrible need and despair he’d omitted Israel. Given the depth of Israel’s rescue work, it cannot have been an oversight. So was it Obama himself who flinched when he saw the troublesome country’s name in the text prepared by his staff? Or did his staff not name Israel in the first place? There’s a story to be told about his speechwriters. And it might just be that they know his prejudices. Anyway, here is an account of this great day in Palestinian terror, perhaps its greatest day, all but forgotten. So this is a reminder by the careful and honest historian Mitchell Bard.